Call Arnold Schwarzenegger what you will, Austrian Oak, Mr Olympia or just sir, he remains a bodybuilding icon. From small town Austria he has risen to Bodybuilding Champion, Movie Star and most recently Governor of California. Arnold Alois Schwarzenegger was born on July 30,1947 in Thal, Austria to parents Gustav and Aurelia. Arnold Schwarzenegger was inspired by Reg Park, Johnny Weissmuller and Steve Reeves whom he watched on the big screen. He picked up his first weights at age 13, working out in the basement. In 1961 Arnold started training with former Mr. Austria Kurt Marnul in Graz, Austria. Arnold arrives in The United States in 1968 and trains under Joe Weider at the Santa Monica Gold's Gym. In his first Mr Olympia attempt, Arnold loses to 3 time champion Sergio Oliva. 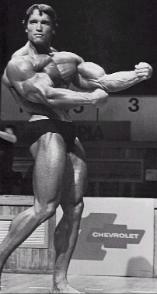 But Schwarzenegger redeems himself the following year, becoming the youngest Mr. Olympia ever at age 23. Eventually he won Mr. Olympia seven times, six of which were consecutive. Arnold Schwarzenegger gained more fame when he was featured in the 1977 bodybuilding documentary Pumping Iron . The movie showed him training for the 1975 Mr. Olympia contest. Arnold did admit to using anabolic steroids while they were legal. Although in 1967 he wrote that they were not used to build muscle, but instead for maintaining muscle when cutting up. Resistance- You must add more weight to in order to make progress. Reps/Sets- For upper body,do 8-12 reps in 3-4 sets.Your lower body will require 12-16 reps over 3-4 sets. End the set when you cannot do another rep with good form. Range of Motion- A full range of motion is required to stimulate all muscle fibers. Contraction- Concentrate on the target muscle while contacting. Maximize the load to target the muscle. Rest- Take 48 hours for muscle recuperation. Lift Heavy- Beginner bodybuilders should lift compound/ powerlifting exercises to build mass. Later add the high rep isolation movements. Once a week, have a "heavy day". Perform powerlifting and strength exercises. Who is Greatest Bodybuilder of All Time? Do you have an opinion on this? Share it! Arnold Schwarzenegger Routine:Here is one of Arnold's constantly changing routines. He was also fond of Reg Parks version of the 5x5 bodybuilding routine.Check out our page on the 5x5 Bodybuilding Routine. Remember that below is a professional routine. It may not work for you. Abs:Same as Monday, Wednesday and Friday.